HDIS: Recipe of the Day! 2. 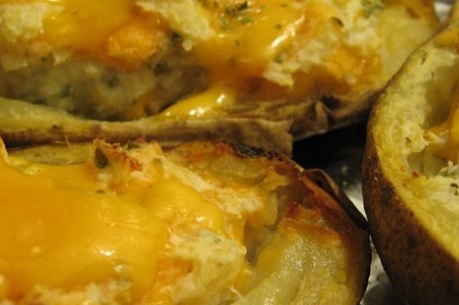 Bake potatoes in preheated oven for 45 minutes, or until cooked through. 3. Slice tops of potatoes and scoop the flesh into a large bowl, leaving skins intact. 4. To the potato flesh, add the cheese and dip. Mix well and spoon mixture into potato skins. 5. Bake for another 30 minutes, or until heated through.